The Ice Fortress is one of the unique Renaissance Christmas event dungeons that players can challenge each December. By hunting the overworld/dungeons for Christmas monsters players can find special scrolls that allow access to these dungeons. Players begin at the entrance of the Ice Fortress surrounded by the Dark Elf Army. 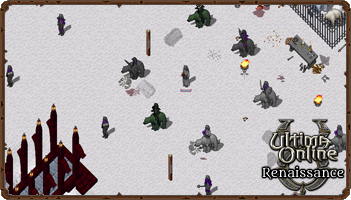 You are tasked with fighting your way through the army and deeper into the fortress. You eventually reach the mastermind of the dark magic corrupting the creatures of Britannia. This is one of the toughest fights and will challenge even the most experienced players. Once the Dark Elf Commander is defeated the scroll owner will be given a key to the fortress's loot which could have one or more of the following.